· Give credit (including URL/link) to the person or Blog that caught you and who made you "IT" I was caught fair and square whilst running away. · Play by the rules - no pinching, kicking, spitting, Chinese burns, crying and definitely no tantrums! Which also means you must post the rules. · List 5 other authors or Bloggers with their hiding places (URL/Links) so that they can be chased down and made "IT" so we can all go home now we've finished playing. Go in, eat supper, and check out THEIR books. Q 1) What is the title (or working title) of your book? Q 2) What genre(s) does your book fall under (or land near really!)? Young Adult, Urban-Fantasy, and Suspense. Q 3) What actors would you choose to play the characters in the film version of your book? Wow, this is a difficult one to answer really…still thinking. Q 4) What is the main outline for your book? Seventeen-year-old Nnamdi tries to unravel the mystery of his father’s will. When he’s accused of killing his girlfriend’s dad, leader of the Phoenix Cult, Nnamdi must choose to either leave the country to escape the fury of the Phoenix members or join an opposing cult, which he’d always detested. Q 5) Will your book be Indie published, self published or represented by an agency and sold to a traditional publisher? I’d love to be published traditionally, but you never can tell… so for the time being I’m focusing on revising and polishing my manuscript. I’m currently on the fifth draft. Q 6) How long did it take you to write the first draft of your manuscript? 8 months. I had to stop writing for a while. Q 7) What other books in this genre would you compare yours to? This one is difficult to answer as I haven’t really read anything comparable. I know there are some out there but I haven’t come across them yet. Q 8) Who or what inspired you to write this book? A short story I wrote in my final year. I kept going back to the story, (rather the character in the story kept calling me back, and screaming, ‘Hey, my story doesn’t end here yet!’) So I just had to continue the story. Q 9) What else about the book might pique the reader’s attention? The series contains a twist to the Phoenix mythology. Did you know that a phoenix flew to Nigeria some 300 years ago? ENJOY GUYS... and if you can't take up the challenge then try and pass it on to another author that might be interested. Wow! I'm grateful for the tagging and dearly appreciate the process. Congrats to you on being tagged as well. It took me a while but I did it!! Thank you for including me to your 'victims'. hehe. Kaykay, your book sounds so different from anything I've read. I love the conflict of fleeing or joining up with something he is opposed to. I hope whatever route you choose to publish that you keep writing. 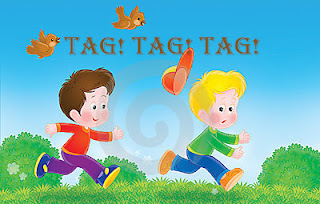 Thanks for the game of tag. I'll get started on my post. Shoot, I wanted to do this post this week. My current writing project is chapping my hide. Hopefully by the end of this weekend I'll be back on track! It'll be great to see your post, Robyn. :) Good luck on your WIP!